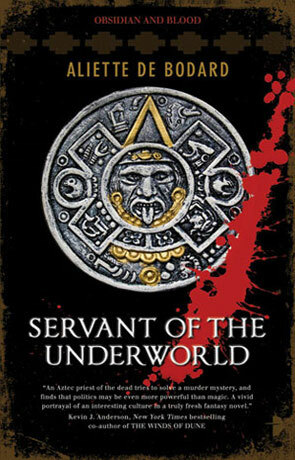 Servant of the Underworld is the debut novel from a rising star in the fantasy world, Aliette de Bodard. Acatl is the high priest of the Dead for the Aztec capital city of Tenochtitlan. It is his role to oversee the dead making sure they receive the correct rituals and rites of passage into the next world. He also has to investigate murders that have been committed using "underworld magic". When an ambitious priestess mysteriously disappears and is presumed dead, Acatl is called in by his superior Ceyaxochitl, High Priestess of the Duality. Although outside of his jurisdiction, residual magic showing "Jaguar" magic having been used rather than "underworld" magic, he is asked to investigate as Ceyaxochitl has her hands full trying to heal the dying Emperor. To complicate matters Acatl's brother Neutemoc, a Jaguar Knight is the prime suspect, having been found in the priestesses room at night, covered in blood that is not his own. The investigation is anything but clear cut, with a good chance the victim is still alive. Larger forces are at work however and it isn't long before Acatl uncovers a plot that is much more serious than a priestesses murder. With Servant of the Underworld Aliette de Bodard has managed to create a living, breathing world from a long dead civilisation. It is clear that a massive amount of research about the Aztec people has gone into this novel, and it really does show. You could be forgiven for thinking that Aliette had lived among the living breathing Aztec's rather than studying a people that died out centuries ago. The Aztec society is shown as a very complex, intelligent and evolved society, but also with a savage, bloodthirsty and primal side. Slavery exists but only for those who are destitute enough to "sell" themselves into it, and they are generally treated much better than slaves in other cultures. Magic is commonplace and exists due to the many Gods granting their worshipers power. Much of this is done through ritual and the sacrifice of the right sort of animal for that particular God. The Gods are very closely connected to the people and often involve themselves directly in the affairs of the people. The world building detail becomes even more apparent as the story progresses and along with the character building, these elements really drive the novel. The detective style plot is very well written, with a number of intelligent twists, turns and shocks and it is a very refreshing interpretation of a dark fantasy crime detective story. Written on 26th January 2010 by Ant.